I remember (from the 1960s), caftans my friends had made out of towels. I seem to remember one horizontally for the yoke (with a slit for your head to go through), one for the front, and one for the back. They were nice for wearing to and from the showers and now I am thinking they would be nice for wearing back and forth to the showers at a campground. I am about to retire and look to do more traveling. Any one remember how they were sewn together or actually constructed? I made one of those robes way back then. I saw a neighbor lady wearing one and studied that. If I remember right a small circle was cut out of the center of the towel that would go cross ways on the robe. Then I centered the two vertical towels on the top one and sewed them in place on the horizontal one. Then I cut a slit vertically in the center, starting at the neckline and going as far down as I wanted it for the length of a zipper. I think I went down quite far, as long as I could find a zipper for. I installed the zipped then sewed matching bias binding around the neckline and then sewed the side seams, leaving about up to the knee open on each side. To sew the side seams I started at the end of one sleeve and went around the arm pit and down the side as far as I wanted the slit to begin. These are really comfortable. The neighbor that had one wore hers almost every morning, they were new in town and had no family nearby and she had new born twins. I took 3 lighter weight bath towels (not the huge and heavy ones), stitched them together at the seams, folded over the top for elastic insert, did a trim around the top and then put a GIANT button and button hole. Wore these pregnant, wore it to the beach, on a hot day when everything else felt bad. My favorite one I still get compliments on at the pool, and I made that one back about 1980. Never wears out. Perfect for over the suit to the pool, making some for my little grand-girls this summer. I cant picture the Giant button & button hole. Where is it put? I get that you put elastic in but I dont get what you mean when you trim the top? And then placement of button. I believe my Grandma made some of these. She took two bath towels and folded the first length-wise, cut a slit for the head in the middle and faced it. She then took the second one and cut it in half width-wise to sew onto the middle of the top towel for the skirt. The arms are sewn at the same time as the sides which is last. It looks kind of like a kimono, I loved it. I've been looking for instructions too for the ones my Mom made for me in the 60's. My recall is that it used one hand towel and two bath towels. I was 16 so pretty much a grown up. The hand towel was folded in half lengthwise. I believe it was slit in the middle a bit more than wide enough to fit your head through, and bound with bias tape. I remember one of the students at my nursing school had the robe you are describing. It was such a great idea. But the neckline on hers was a boat neck so the robe did not require a zipper. There was a space under the bustline where the horizontal towel met the long front and back towels that held a ribbon of about 1 1/2 inches in width. This was used as an adjustable tie that flattered the fit. There were 2 slits, 1 on either side of the legs, for ease of walking. My Mom made these in the 60's with three bath towels, usually using patterned towels, as described. 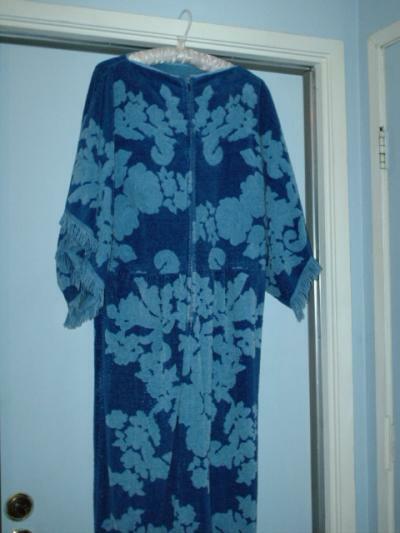 She also bought a hand towel in the same pattern as the bath towels + cut it in half to make patch pockets on the robe. If you get towels with fringe, you can place the fringe on the bottom of the robe and the bottom of the pockets. She made them with heavy duty, full length zippers in front, which was convenient. Does anyone have the pattern for making a robe from towels. It was very popular in the 60's. Thanks! It takes three large bath towels. One across the shoulders for the upper body and arms, hole for the head cut/shaped/bound (in matching colored biased tape that is hand finished to lay down inside robe edge), to accommodate a long zipper(preferably invisible if you sew well and the towel is thin), for the front. The other two towels were sewn to the middle lower edge of the top one, back and front. The long zipper opening is also cut much of the way down the front towel that is split vertically to allow the "step in" robe, with side slits at the knees left unsewn to allow for movement. very important to do so as smoothly as possible for maximum comfort. This finish out can make or break the robe's usefulness/comfort. It had no pockets which would have been too thick. Tip: Cut the head hole very evenly, oval, slightly forward, higher in the back, lower in the front, but not too low. Cut EXTRA straight when cutting the front and top towel zipper opening. Double stitch all seams, binding any raw edges inside, VERY WELL, because Terry edges fray badly when left raw. the smallest persons having the benefits of looser fit, longer sleeves and robe length, wqith this "one size fits all, back then" design, but the med./larger persons having a snugger fit, shorter sleeves and a slightly shorter finished robe, depending on the person's height. Use the best poly-blend thread you can afford, carefully matching the towel. Keep in mind that this makes for an "Empire Robe", with a seam right across the breast, if young/small, or on top of the breast, if for a more mature/larger person. Young people preferred solids and velour. Older preferred the patterned terry in two-three colors, longer looped weave. YES Linda that is the one I remember my Dad had a lady sew it for me as a Christmas present. The only difference in mine was no zipper it had an empire waist with elastic and you could pull it over your head. Thanks for the instructions. Does anyone know how to make a robe from bath towels? If so, I would appreciate the instructions. Thanks. I just ordered a pattern from "Linda's Sew Be It" which is what you are looking for. Good luck. See this site for more pictures. Click on the picture and they enlarge. I hope you are able to make it now with the pictures and Lynda's instructions. If I see the right towels, I may try. I make the children's for the pool. I use hand towels. 1 for hood, 1 for arms (cut in half), one for back and 2 for front. So that would be 5 towels. They are the envy of moms at the local pool. I made these for my boys growing up till it was not cool any more (they loved them on lessons' weeks) and my granddaughters love to wear theirs. Try this site. I was looking for instructions, as well. Years ago, my former mother-in-law made one for me and I loved it. Good luck with your project.